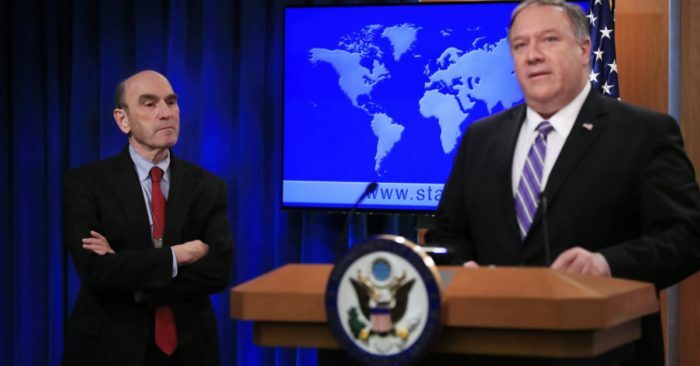 Elliott Abrams, left, listens to Secretary of State Mike Pompeo talk about Venezuela at the State Department in Washington, Jan. 25, 2019. STATE DEPARTMENT — U.S. Secretary of State Mike Pompeo has appointed foreign policy veteran Elliott Abrams to be U.S. envoy to Venezuela, tasked with helping “restore democracy” to the South American nation. Pompeo made the announcement Friday afternoon in Washington, ahead of a special session of the U.N. Security Council on Saturday. Pompeo said Abrams would travel with him to the meeting, which was initiated by the United States. Pompeo said the United States thinks “every country ought to recognize” National Assembly leader Juan Guaido as Venezuela’s interim leader, as the U.S. does. He called disputed President Nicolas Maduro a “cruel dictator” and said he had caused much devastation for the people of Venezuela. Pompeo said the U.S. hoped Venezuela would have free and fair elections to designate a new leader. He also vowed that U.S. diplomats in Venezuela, ordered out of the country by Maduro on Wednesday, would be protected while in Venezuela. He said the U.S. government was taking “all appropriate measures” to ensure their safety. He declined to give details on those plans. 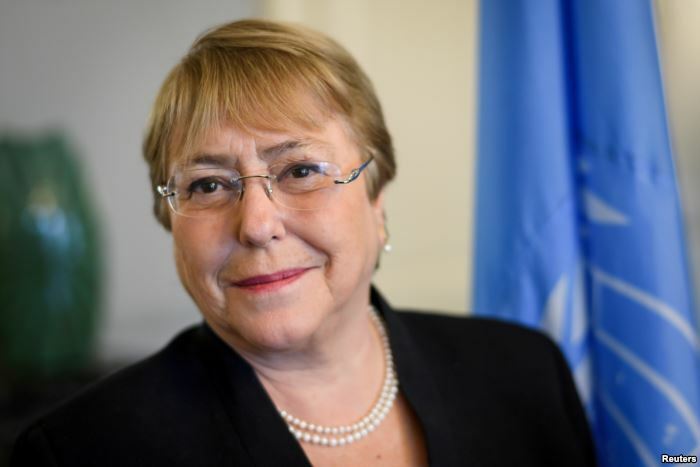 FILE – Former Chilean President Michelle Bachelet, who is now U.N. high commissioner for human rights, is pictured in Geneva, Switzerland, Sept. 3, 2018. In a statement, Bachelet called for an independent investigation into the violence that has killed 20 people and resulted in the detention of more than 350 in protests over the past week. “Any violent incident resulting in death or injury should be subject to an independent and impartial investigation to find out whether there was excessive use of force by the authorities, or if crimes have been committed by members of armed groups, whether pro-government or otherwise,” she said. FILE – Venezuela’s President Nicolas Maduro gestures during a ceremony to mark the opening of the judicial year at the Supreme Court of Justice in Caracas, Venezuela, Jan. 24, 2019. 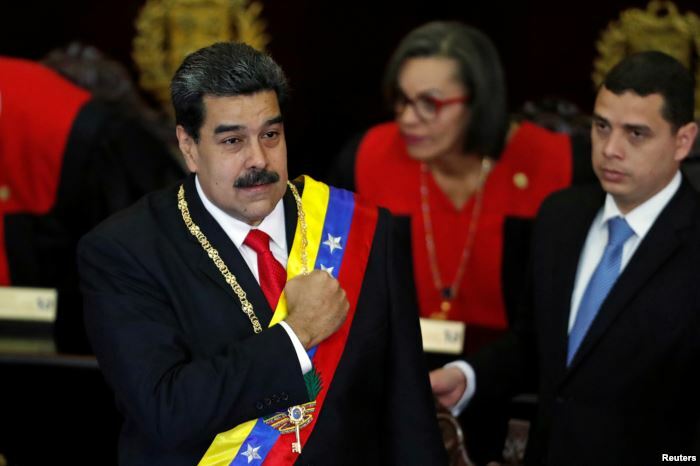 On Wednesday, Maduro said he was ending diplomatic relations with the United States in response to U.S. President Donald Trump’s announcement that the U.S. was officially recognizing Guaido as Venezuela’s interim leader after Guaido swore himself into office. Trump bluntly warned Maduro on Thursday that “all options are on the table” if there was not a peaceful transition to democracy in the South American country. Also Thursday, 16 of the 34 nations in the Organization of American States recognized Guaido as interim president of Venezuela. Pompeo urged members to oppose the “illegitimate” Maduro and pledged to make $20 million available for humanitarian assistance to Venezuela. “All OAS member states must align themselves with democracy and respect for the rule of law,” the top U.S. diplomat said. Meanwhile, the State Department ordered nonemergency personnel to leave Venezuela, but it is not closing its embassy in Caracas. 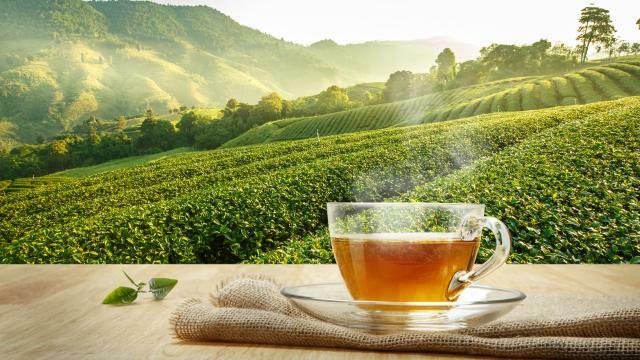 The department said it was ordering the evacuation for security reasons, and that U.S. citizens should “strongly consider” leaving the country. 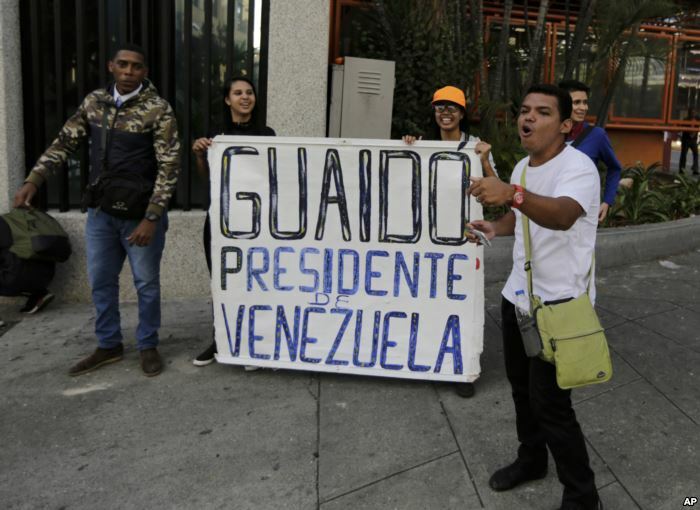 FILE – Anti-government protesters show a sign reading in Spanish “Guaido, President of Venezuela” after a rally demanding the resignation of President Nicolas Maduro in Caracas, Jan. 23, 2019. White House officials emphasized that Trump was not ruling out any response, such as a naval blockade or other military action, if Maduro unleashed violence against protesters or took action against Guaido. Several nations have joined the U.S. in recognizing Guaido as Venezuela’s interim president, including Canada and 11 of the 14 members of the newly formed Lima Group of Latin nations, among them Argentina, Brazil, Chile, Colombia, Costa Rica, Guatemala and Peru. French President Emmanuel Macron called Venezuela’s elections “illegitimate” in a tweet on Thursday, and saluted the bravery of Venezuelans demanding freedom. FILE – U.N. Secretary-General Antonio Guterres speaks during a meeting of the Security Council at U.N. headquarters in New York, Sept. 20, 2017. 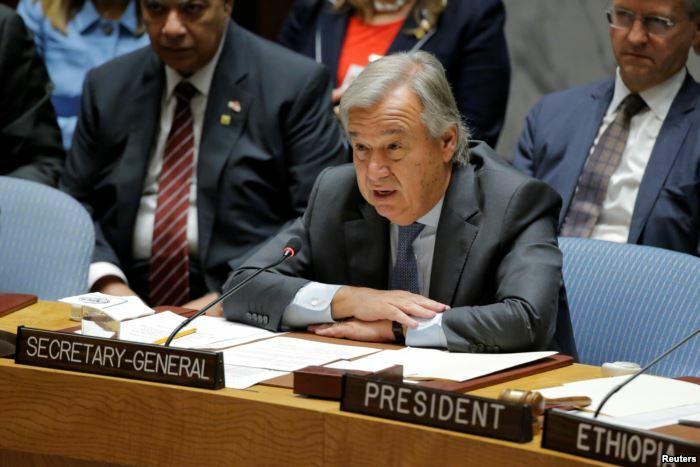 U.N. Secretary-General Antonio Guterres warned Thursday that the situation in Venezuela could descend into “disaster” if the country’s main political rivals failed to reach an agreement. But officials in Russia, one of Venezuela’s biggest allies, reacted with anger Thursday at the United States and other Western nations for backing Guaido, accusing them of interfering in its internal affairs. Russia’s Foreign Ministry warned the United States against any military intervention, saying such a move would have “catastrophic” consequences. China urged the United States to stay out of the crisis. Beijing and Moscow have extensive economic interests, having loaned Caracas billions of dollars. Bolivia, Cuba, Iran and Syria also issued statements throwing their support behind Maduro.